"It's funny! It says 'I choo-choo-choose you' and then there's a picture of Aquaman." Well, on the plus side? It is a Monday and we have a new Wait, What? for you--almost an entire day early! On the minus side, we won't be recording this week due to Valentine's Day, so there won't be a recording next week, I am totally behind the eight ball on my other projects, and I couldn't get Graeme to draw a Don-Wan Kihotay for us. After the jump, this week's episode and some super-speedy show notes! 0:00-3:18: Odd greeting! Neurotic confession! Bizarre Love Triangle! Can you tell which one of these is a description of our opening, and which one is a New Order single? 3:18-12:34: Strange Press Release! (Another unsung New Order single.) Graeme and Jeff discuss the recent press release announcing the Rogue and She-Hulk novels for female readers. 12:34-20:17: From arguing about mythologies in tie-in products, we move on discussing whether Disney is getting too crazy with their Star Wars movie plans or not. 20:17-31:37: Jeff isn't sure how to he made the jump between Star Wars films and the twin legacies of Sylvester Stallone and Walter Hill. (The term "twin legacy" is used, and Luke and Leia are twins with a legacy?) Nonetheless, if you were hoping to have a healthy dose of "Hey, you kids, stop misunderstanding the historical legacy of my lawn!" YOU ARE IN LUCK. (Please note: when Jeff says "Lawrence Silver" in his triade, he really means "Joel Silver." 31:37-1:07:48: And from a topic of nostalgia and misunderstood legacies, Jeff tries to look at Marvel's Jack Kirby Captain America Omnibus and the hardcover collection of Neal Adams' Batman Odyssey. 1:07:48-1:08:24: Intermission the First! 1:08:24-1:12:54: And we're back. Most of you probably know about my beard, but not many of us know about Graeme's secret sideburns…or about his even more secret interview with SKY NEWS. 1:12:54-1:22:28: The battle for New Comics begins! 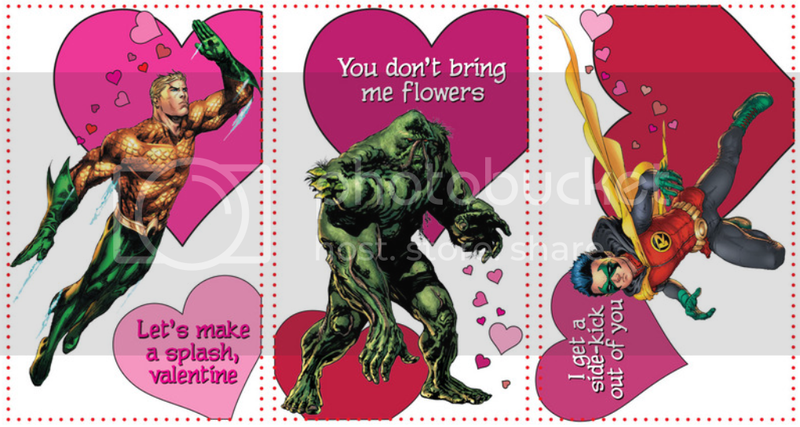 Graeme has read Young Romance: New52 Valentine's Day Special and the first Jeff Lemire-scripted issue of Green Arrow. Graeme didn't like them much. Jeff saw the preview trailer for Injustice: Gods Among Us. Arguably, he liked that even less. And then came…the dreaded tech problems. We liked those least of all. 1:22:28-1:22:52: Intermission the Second! 1:22:52-1:36:05: We are back, to continue with a bit of grousing about DC. Graeme has read the huge DC: 75th Anniversary book by Paul Levitz, leading to a conversation about what made DC great in the past. We are excited about the new digital Superman book, maybe not so much (or at all) about Orson Scott Card, but we are very excited about Jeff Parker, Chris Samnee, and others. Graeme has also got a sneak peek at Superman: The Unauthorized Biography by Glen Weldon. 1:36:05-1:45:22: Jeff talks a little about the fourth issue of Multiple Warheads, in a "I would really rather talk about it when we've both read it, but Graeme keeps asking me questions" sort of way. Also, Jeff doesn't wants anyone to think he's super-high but he decides to compare Multiple Warheads to Zero Dark Thirty for some reason? Graeme gives the low-down on the Netflix remake of House of Cards. 1:45:22-2:11:25: Questions! We do manage to answer some questions (honestly, we were supposed to answer more and once again we got distracted). Here we are speeding questions from four Whatnauts: Jesse M. on December 6th, 2012 at 7:08 pm asked: No way you’ll have time to answer all of these, choose one! 1) What’s the single issue of a comic that you love best? 2) I’ve been loving Journey Into Mystery From Gillen and Immonen. Once Immonen’s Sif run is finished, what team should tackle the Warriors Three? 3) Are there any current comics that would benefit from a JiM/BPRD style spinoff? Ben Lipman on December 6th, 2012 at 7:22 pm asked: Should Marvel bother with covers? They print them on the same stock as the pages, the books are ordered months in advance and sell to an audience that actively seeks them out. Why not save the price of more pages/art and just have the title sit above the first page? Is FATALE becoming an ongoing series a good thing? I enjoy it though it’s not their best, but was looking forward to Bru and Phillips moving on to something else. What was the best and what was the worst comic you read for each decade you have read comics? Zomboner on December 6th, 2012 at 8:03 pm said: What happens to Ross’ moustache when he turns into the red-hulk? mateor on December 6th, 2012 at 9:28 pm said: How about… A) Has anyone, ever, done more for a comic than Eddie Campbell did for From Hell? B) Could we expect a modern reader to get anything out of the big 2 comics “masterpieces” of our youth? I am thinking of in continuity stuff here, something like Simonson’s Thor here, a book that pretty much ruled my world growing up, yet something I will ever be able to properly explain to my son, even if he had the issues in front of him. I don’t have the same doubts about Romita’s Amazing or other earlier runs, there is just something about those eighties books that seem stuck in time. C) If you gave 100 people on the subway issues of Bill Sienkeiwicz’s New Mutants (with the lovely painted covers removed) how many would tell you it was the worst looking comic they have ever seen? and D) What would happen if Robert Kirkman decided to spend his next month’s income and buy the publishing arm of Marvel? Not the IP, just the right to publish Marvel comics the way he wanted…which characters would die each month and by which blunt instrument? How sad would the Punisher be while he used his slowly diminishing appendages to get the rest of the Marvel U killed, one 100 issue spectacular at a time? Who would he think was calling him while he cried into a disconnected telephone and would he still have the beard? Would Aunt May be the big bad? 2:11:25-end: Closing comments! Many apologies! Graeme tells you something that would make him laugh! Nothing but exclamation points! Or…are there? We hope you enjoy, thanks for listening, and we hope you have a grand Valentine's Day.